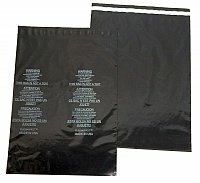 These are black opaque self-seal 2.0 mil poly bags with imprinted suffocation warnings in three languages. Meets Amazon requirements for packaging adult products. Opaque - contents cannot be seen through the bag. Easy peel and seal closure. Suffocation warning in English, French and Spanish. High quality bags made in the USA.